THE RECOMMENDATION: One of my favorite types of films is that which takes place in a single location. The restrictive nature that one location brings often leads to quite novel and fascinating story developments you don’t get with a slightly larger story or a sprawling epic. And one of the cardinal rules about these types of films I’ve come to recognize (for my own taste) is never to leave that location, because once you do, the story tends to suffer and the “gimmick” that makes the film unique is lost. Room breaks that cardinal rule but, interestingly, doesn’t suffer too badly. I did find myself thrown off in terms of pacing because my curiosity took the better of me. If the escape from room isn’t the end of the film, what is? What will the characters do once they’re free and have an entire outside world to explore? Won’t the film now feel like two related but independent stories? 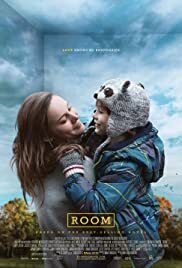 For the most part, Room provides decent answers to these questions and that’s the reason why I feel the story doesn’t suffer too badly. Another part of that equation is that Joy (Brie Larson) has been captive for seven years and her son Jack (Jacob Tremblay) has been alive for five years. Their lives and this world in room have been around longer than what we see and that existence is clear to the audience. In other words, since Joy and Jacob have a history in room prior to the starting of the film (rather than the kidnapping being the first plot point), it feels okay that the finale of the film isn’t the escape. Whether inside or outside of room though, Larson and Tremblay’s performances are the shining stars of this film. Without such superb performances, much of the film would have fallen flat and the emotional toll would have been a lot less. As it is, you feel trapped and frightened as Joy and Jack do, but you’re also filled with a sense of hope. Not only that Joy and Jack can see the outside world, but also live rich and fulfilling lives once they are. Brie Larson looks to be locked in to win the Academy Award for Best Actress this year, and rightfully so (although, Saoirse Ronan puts up a good fight with her performance in Brooklyn). To me though, the highlight of the film is Jacob Tremblay’s performance which is beyond phenomenal.